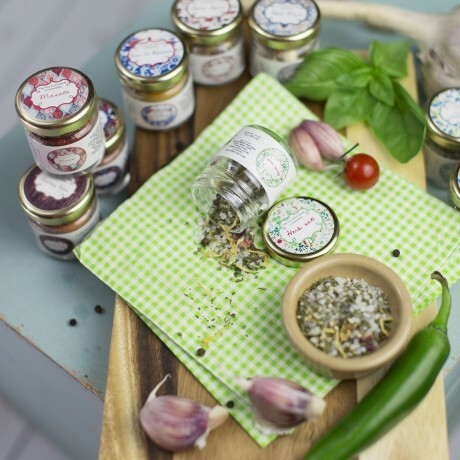 Gorgeous selection of six gourmet cooking condiments and seasonings. Looking for the perfect gift and running out of ideas? Bored of the same bland food everyday? In that case, don't look anymore. You have just found the perfect gift! This is a lovely wrapped box of six stunning condiment jars, from our wide range of original flavours: Paella Seasoning Ras el Hanout, Fish Soup, Smokey Bean, Steak Seasoning, Herbs Salt and much much more!If purchased as a gift, the box can be posted to an alternative address. 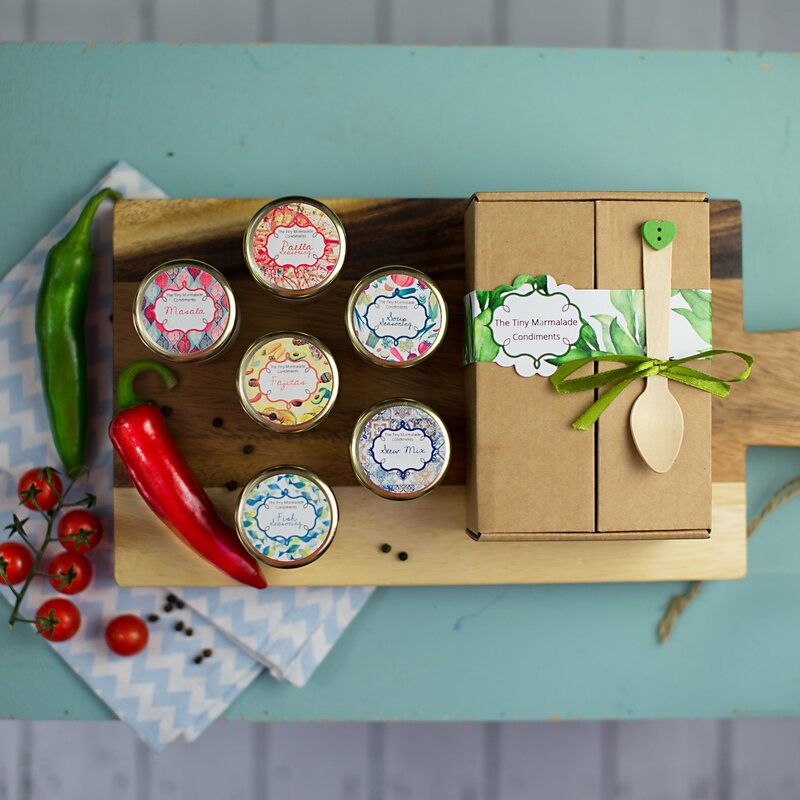 This excellent collection of our amazing condiments is the perfect gift for any keen foodie! It inluces a selection of 6 delicious flavours perfect for every meal. 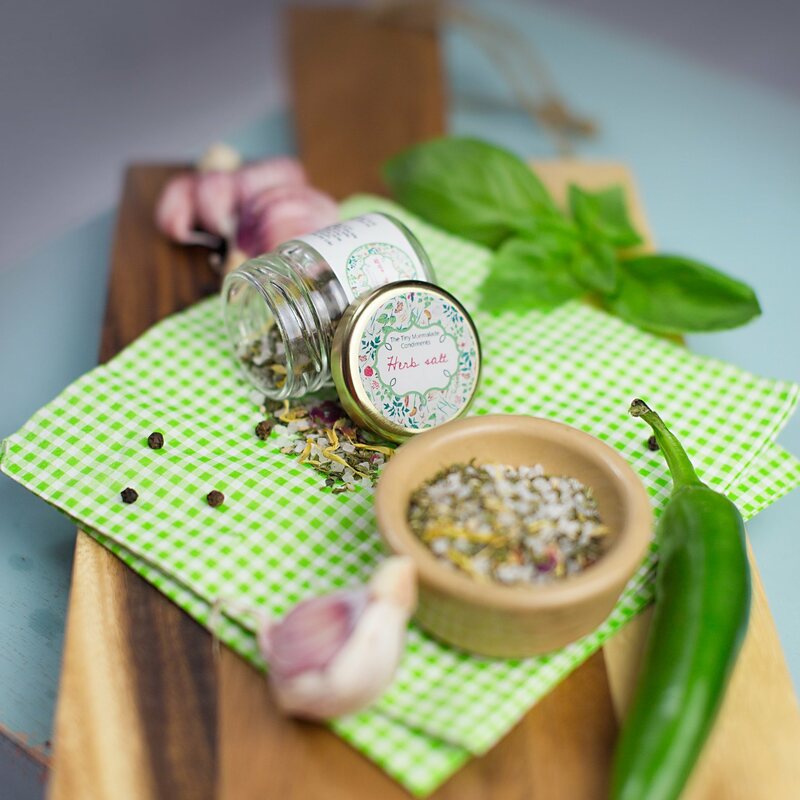 All our condiments have been carefully blended by hand and come ready to be used with your favourite recipes. All of the spices in this taster box are suitable for vegans and vegetarians and they're also wheat and gluten free. If you're a fan of spices or just don´t know where to start, then this product is for you. 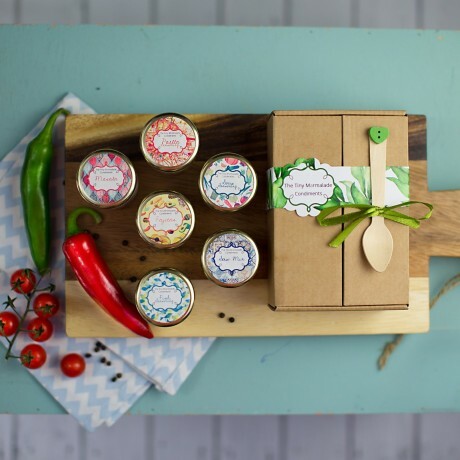 This excellent collection of our amazing condiments is the perfect gift for any keen foodie! It inluces a selection of 6 delicious flavours perfect for every meal. Our condiment blends are made with a variety of herbs, peels, seeds and salts with no additives, artifical colourings or flavourings. Range includes: fish seasoning, paella seasoning, smokey bean, tagine spice, steak spice, soup spice, herb salt seasoning, bengali 5 spices, ras el hanout, masala seasoning, and much, much more! Condiment varieties may vary within the year. Full list of ingredients available in labels according to food labelling regulations. Labels and all packaging are made of paper and cardboard. All of our condiments are blended in an area containing nuts & seeds. Gluten Free. Purchases as a gift for my sister's birthday. Purchases as a gift for my sister's birthday. She just loved honey and was over the moon with this. She would definitely recommend. Ordered these for my mum for mothers day and she really loved them. Very well packaged and presented. They arrived very quickly as well. It arrived on time and the recipient loved it. It arrived on time and the recipient loved it. They thought it was packaged beautifully too. Beautifully packaged and quick delivery. "The Tiny Marmalade is truly delicious and so cute! "The Tiny Marmalade is truly delicious and so cute! The presentation is stunning. Time and thought goes into every tiny jar. Can't wait to use them again and again." This product is dispatched by The Tiny Marmalade. This item has a shipping weight of 500g.